Steelcase Alight Lounge by Turnstone (SCALNG) at Pure Design / Seating / Workspace ::: Furniture for the Home, Office, Home Office, and More at Pure Design Online! Light-scale lounge pieces designed for impromptu and collaborative spaces. Sets the stage for creative thinking and a more relaxed working environment. Unique and distinctive, perfect for reception, lounge, and teaming areas. Available in three shapes that work together or independently: Bench, Corner or Round ... mix, match, or connect for fun designs that twist and turn. Ships fully upholstered with your choice of either Buzz2 Fabric, or (for an additional $10, as indicated) Cogent Connect Fabric. Comes starndard with world-renowned Turnstone quality and a five year warranty. 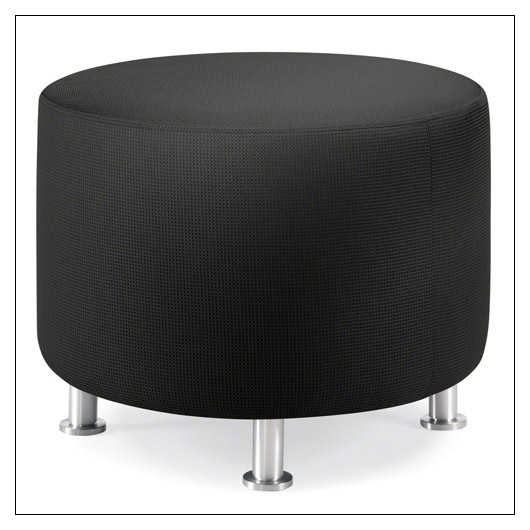 These ottomans come with brushed aluminum legs. For an additional $20 we can swap these out for Solid Maple Legs (stain options are Natural Cherry, Clear Maple, or Dark Walnut). We can also add on a Ganging Kit (+$19), which is a connector to put more than one ottoman together. Please contact us if you'd like to add these options to your order. "Lower 48" United States sales only. Please allow up to two additional weeks to ship.